What a fantastic way to get your brand messages accepted with crowds out there with this customized monkey shaped bottle opener keychain! This monkey offers its large back for you to imprint business messages. This token not only hangs around as a keychain but also makes a great party popper (read bottle opener/can opener) as well as amusement token. It screams attention from over back packs, purses, belt loops, car boards, or wherever it is used. It aids to small budget marketers to forge emotional attachment between their brand and the user. 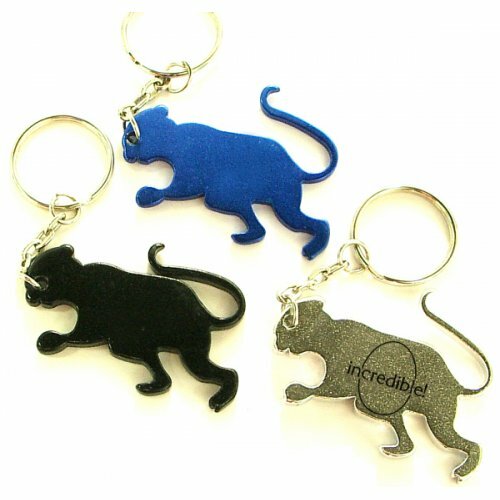 Request for a quote to know about discounts that we offer on bulk orders of this custom monkey shape bottle opener keychain. Features – Monkey shape bottle opener with key ring in metallic finish. Available color - Metallic Purple, Metallic Black, Metallic Gold, Metallic Blue, Metallic Green, Metallic Red and Metallic Silver. Product Size – 2" x 1 1/2"
Imprint area – 1" x 1/2"
Product Size :2" x 1 1/2"